I spy with my little eye! What do you see? Here is my larger piece on an Opus tile which was inspired by The Diva's 'Beads of Courage' challenge this week. A seed of an idea was there but I just didn't know how it would grow. 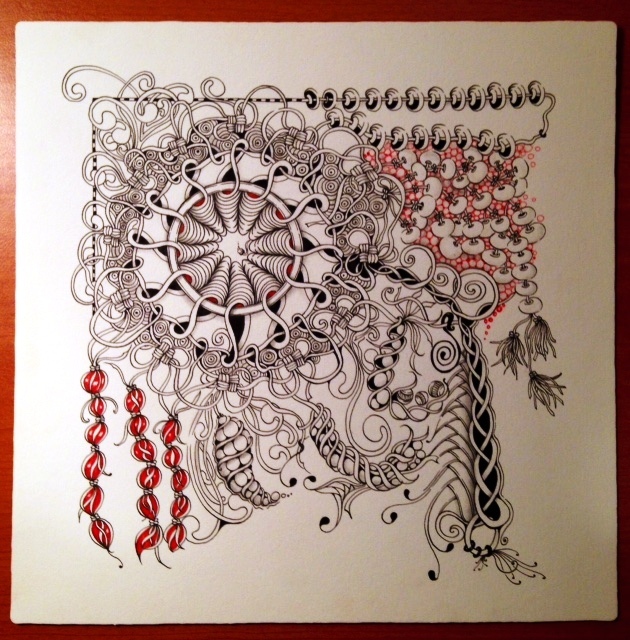 I love that element of surprise with Zentangle art, when out of the blue something fun turns up! A fabulous piece of art! I always LOVE seeing your work. Your creativity is so fun, flowy (is that a word? ), and imaginative! Beautifully done! Thank you for sharing. (sorry if this posted twice, not sure if my first post went through). I love how nearly everything in this piece seems connected to the others. It's kind of like my ideal view of humanity: We are all different but still connected. Amazing piece. Thank you Denise that is such a beautiful thought. Love the result. Was wondering what you would come up with. Love the touch of color and the combination of tangles. How much do you "see" before you begin? This is lovely, Michele. It's very fluid and I love the way that many of the tangles are open at the edges and ends, and how they flow one from another. The little touch of colour is a master-stroke, too, and I love the minimal framing around the top left corner. Really cool art!! This is the most tangled tangle I have ever seen! You have such a wonderful way of mixing up bits and pieces to make a beautiful whole interrelated thing. For me, the best little bit is the teardrop bit in the center. How do you think of this stuff? Amazing and so beautiful! Thank you Antonine, it surprises me too at how this stuff lands on the page! !